Use UPI payment mode to complete the payment. Get Rs 225 Cashback on order of Rs 1000 and above. HDFC card offer brings flat Rs 200 OFF on groceries online order. Payment should be done via HDFC Credit and Debit cards. Coupon/Offer Details: Pay 20% less on your order by using your Orange cash. Get flat Rs 250 discount on your online order. Purchase value should be Rs 1500 or above. Payment should be done via Axis bank debit or credit card. Order at Grofers and make payment using Airtel payments bank to get flat Rs 125 cashback. Buy household needs and get up to 60% OFF without using any coupon code. Choose from household products like Harpic, Lizol, Vim, Coconut, Tide, Surf excel, Rin, Colin etc. Buy personal care products and get up to 60% OFF. Get flat 10% SuperCash when playing via MobiKwik. Maximum SuperCash amount - Rs 200. 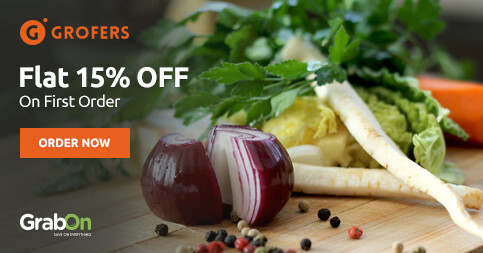 Shop at Grofers and get upto 80% off on grocery and staples included rice & flour, edible oils, ghee, spices, salt, sugar, dry fruits, nuts & pulses. All the products mentioned are obtaining now with special discount at grofers without using any discount vouchers. Grofers just launched All Under Rs 199 store, where every customer can avail all groceries, staples, snacks etc. at under Rs 199 from Super Store. Order wide range of body wash products @ Rs 99 only. Delivery of Milk, Egg & more by 7 AM, with a free newspaper! Available in Gurugram, coming to other cities soon!. Hurry! Buy per care products and get up to 50% OFF. Here you can get food & grroming accessories for dog and cat. Grofers is an all-in-one store because it not only provides groceries to its customers but also gifting items, electronics, cosmetics, and more. Its product catalog includes fruits, vegetables, dairy products, spices, make-up items, flowers, bakery items, gadgets and more. You don’t have to go anywhere but just click and get what you want at your doorstep. New users can now get flat 20% Cashback on their first order. Over 5000+ products available at the best discounts. Get flat 20% instant discount using HDFC debit or credit card for payment. Maximum discount is Rs 200 on any order value. Avail flat 20% OFFusing ICICI debit or credit card for payment. Discount is capped at Rs 200 on all orders. Avail flat Rs 250 instant discount using Axis debit or credit card for payment. Order value should be Rs 1500. Get up to Rs 300 cashback by making payment through Paytm wallet. Order value should be Rs 1800 to avail this cashback. After making the first payment through Paytm, need toactivate the deal on Paytm App else no cashback will be earned. You can choose to avail Rs 150 Cashback after the first transaction or Rs 300 Cashback after 2 transactions. Grofers charging Rs 29 as delivery charges on orders below Rs 500. You can avail free shipping on all orders above Rs 500. You can select the delivery date and time according to your convenience. They are using E-rickshaws for delivery in selected cities. This can help to reduce the delivery charges by 25%. Housefull Sale used to happen in 1st to 7th of every month. Here they offer huge discounts on monthly groceries. Grofers Saving Club members get codes to get discounts during this period. Here you can get up to 50% OFF on grocery and staples. Here you can get below products from this category. Pulses: Arhar, Moong, Urad, Rajma & Chana, Masoor, Soya, Dried Peas & Others, Organic Pulses etc. Atta & Other Flours: Atta, Besan & Sooji/Rava, Maida, Soyabean Flour etc. Rice & Other Grains: Basmati, Sonamasuri & Kolam, Other Rice, Poha, Daliya, Millets etc. Dry Fruits & Nuts: Almonds & Cashews, Nuts & Seeds, Raisins, Pistchios, Walnuts, Anjeer, Apricots, Pumpkin Seeds etc. Edible Oils & Ghee: Health Oils, Mustard Oils, Sunflower Oils, Soyabean Oils, Olive Oils, Rice Bran Oil & Others. Spices: Whole Spices, Powdered Spices, Ready Masala, Cooking Paste & Others. Grofers does offer exciting discounts to its customers. To grab all those, GrabOn is the best place. Check the list of offers and coupons offered by Grofers here and choose the appropriate one for your order. Grofers Grand Orange Bag Days With 100% Cashback Is Here! Grofers is offering 100% cashback upto Rs 5000 on grocery shopping during its Grand Orange Bag Days running from 19th-27th January 2019. All you need to do is pay Rs 50 to join and the last day to join is 12th January. On orders placed between 19th to 27th January, you can avail 100% cashback in your wallet. You can use this cashback to pay for 20% of any order you place after 31st January. The 100% cashback can be availed multiple times or at one go. The sale is valid in cities like Delhi NCR, Jaipur, Kanpur, Lucknow, Ahmedabad, Mumbai, Pune, Hyderabad, Bengaluru, Chennai, and Kolkata. How To Use Grofers Coupons On GrabOn? It is always a task to go grocery shopping. Even if you get yourself to get out of your house. You are bound to forget something or the other. Or worse, and this has happened to everyone who has gone grocery shopping more than a couple of times, you go for one thing and get everything but that. Online grocery shopping has come like a savior to every forgetful grocery shopper. At the time of check out, you can see and check if you have ordered everything on your grocery shopping list. See that way you don’t have to keep going back. Grofers has become one of the top online shopping sites, with a wonderful collection of fruits, fresh veggies, instant-cooked and quick bites why not? It takes care of everything. For an insatiable hunger, this is the right place to shop where you find a great selection of groceries, dairy products, vegetables, and fruits. All just a fingertip and few clicks away. Look for their custom baskets to enjoy great grocery and hassle-free shopping. For household needs, you can shop all the home needs too. Buy curtains, carpets, and table linens on this online shopping app. Get even your baby and pet care needs. Get all your home essentials here from eating to cleaning. Everything. The best part is, they have the best prices out there and have a lot of payment options. Make sure you use Grofers offers that we provide you with to get even better deals on all your groceries. All their products ordered online are delivered to you in less than 90 minutes.